Who is this chair meant for? BestOffice has been manufacturing great ergonomic office chairs for years on end. Once again, they have come up with an excellent budget office chair, the Ergonomic PU Leather Office Chair. If you are familiar with BestOffice chairs, you have to admit that this one comes at quite a low price compared to some of its counterparts. But don’t let the low price fool you. Despite its affordable price, this chair is rigged with thoughtful features some passed down from its predecessors and others specially designed just for you. Don't believe us? See for yourself. The whole point of buying an office chair is to enhance your comfort in the office while maintaining an ergonomic seated posture. True to its name, the BestOffice Ergonomic PU Leather Office Chair delivers comfort and great seating posture. Being one of the latest office chairs from BestOffice, this chair has seen some pretty solid improvement from its predecessors. 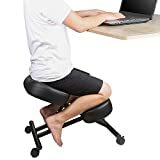 For one, previous versions of the BestOffice chairs did not have lumbar support and would lead to backaches among other posture-related problems. The armrest was also a problem as they got in the way of reaching your desk. However, the PU Leather Office chair comes ready to correct its past mistakes by having adjustable lumbar support and then some. The PU leather office chair is specifically meant for any office user (be it at home office or at the workplace) looking for comfort and good sitting posture. For one, this chair is incredibly easy to assemble thanks to the detailed manual accompanying it. It also helps that it comes with pretty straightforward controls making using it that much easier. To top all this off, it comes at a really affordable price, so you have no excuse for missing out on it. 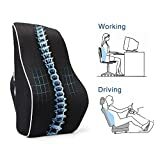 However, we would not recommend this chair for anyone who is already experiencing back problems; although this office chair comes with lumbar support, it is not sufficient enough when compared to other ergonomic office chairs. Unfortunately, this chair does not come readily assembled, but there is nothing to it. It comes with five wheels mounted on their casters which fix easily onto the wheel frame. Additionally, there is a gas cylinder that sits on the metal base of the chair responsible for adjusting its height. You also get a handful of bolts that will help in keeping the chair upright and steady. All you need are ordinary home tools like a screwdriver to get the job done. Most importantly, you get a well-detailed manual in the box to help ease the assembly process. It is constructed of a leather material which is easy to maintain and durable. On top of this, it has a stylish design. You can easily adjust the height of this chair using the level beneath the seat cushion. It rises up to 23 inches which is enough to match the height of most desks. This helps in getting around the office as well as avoid maintaining the same sitting position for hours on end. This weight limit is generous enough to accommodate most users. The chair is made of PU leather material and is well cushioned to provide comfort while working. As much as we all love a budget-friendly product that delivers, we can't ignore the shortcomings of the BestOffice PU Leather Chair, such as the lack of a headrest and good lumbar support. An alternative for anyone looking for these features would be the Acepro Office Chair PU Leather Gaming Chair. 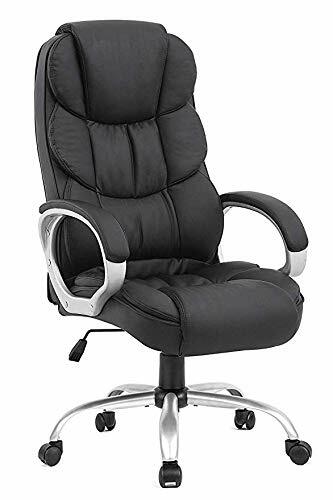 If you are looking for an ergonomic chair for your home or work office, The Ergonomic PU Leather office chair is worth considering. It comes at a pocket-friendly price and will last you a while before you have to think of getting another chair. When it comes to ergonomics, this seat delivers thanks to the ability to adjust its height, reclining and swiveling features. 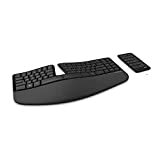 However, it lacks sufficient lumbar support, armrest adjustability, and a headrest, all which are important for a good sitting posture. For this reason, it does not cut it as a gaming chair or one that can be depended on for prolonged office use. Previous Post How to Remove Hair from Office Chair Wheels Next Post Best Standing Desk for Laptops?